Play 2 New Slots The Three Stooges II And Builder Beaver At RealTime Gaming Online Casinos. RealTime Gaming online casinos presented this month two new video slots: The Three Stooges II and Builder Beaver. Paging all Three Stooges fans! The 3 kings of slapstick comedy are back in this comedic IP licensed slot machine from Realtime Gaming. 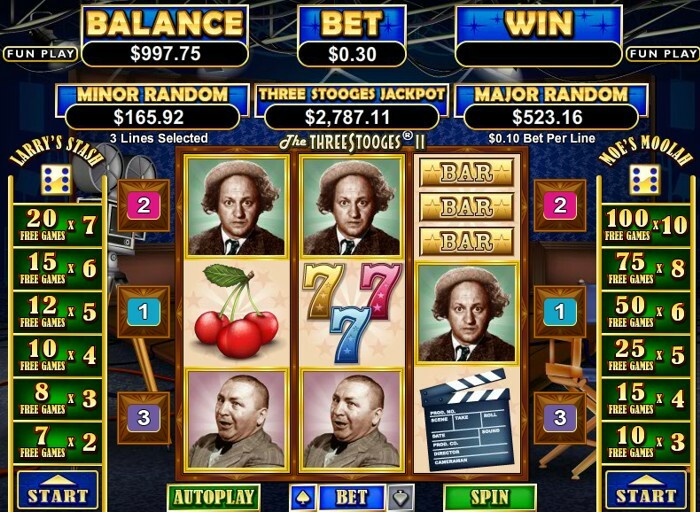 The Three Stooges II® features unveil slapstick comedy at its best in this classic 3 reel slot game, with each Stooge triggering their own fun and playful free games feature. Get hold of Larry's Stash and win up to 20 free games with prizes multiplied by 6, or earn Moe's Moolah to receive up to a massive 100 free spins with all prizes multiplied by 10x! Prize ladders complement this character based game, offering the opportunity to roll a dice and land some great cash wins. Curly's Cashola awards a handsome 9 free spins with prizes doubled (2x multiplier), and everybody can be in the running for the Three Stooges. Any 3 mixed Curly, Larry or Moe appearing on a payline during these free spins adds 1 free spin to the current feature. Progressive Jackpot. Fans are also treated to an authentic Stooges clip upon triggering any one of 3 features making this the ultimate Larry, Curly and Moe experience! Three random jackpots can be hit on each spin with minimum values: US$300, Major US$200 and Minor US$50. No win during free games awards a bonus prize ranging from 10 to 200 times Bet. A total free games win greater than 0 and less than or equal to 2 times Bet awards a bonus prize ranging from 5 to 100 times Bet. Spend a day on the river with the cutest collection of hard-working beavers you'll ever find in Real Time Gaming's newest online slot, Builder Beaver! Break the dam by triggering 2 different Free Game Bonus Features! The Beaver Feature will give you Free Games with prizes tripled (3x), while the Sign Feature will double your prizes and give you extra substitute symbols on the reels to boost your winnings! Five top-paying Beaver symbols will award a massive 10000 x bet per line jackpot! With 2 Free Game Features, huge coin prizes and extra random jackpots that can be won at the end of any spin, Builder Beaver is sure to put a toothy smile on your face. Try it today! Play the new slot machines at SlotsPlus Casino (get 200% double match bonus up to $7,000 free) or Sloto'Cash Casino (up to $7,777 free in various bonuses). Claiming bonuses is easy, just download the casino software, make your first deposit and your bonus will be automatically added to your account balance.